We listen to music when we’re bored, depressed, confused, happy, or anxious. Songs from our favorite artist ease our nerves. Frankly speaking, it is difficult to live without music. To enjoy songs, most people will connect a headset to their mobile device. Then, they’ll turn on the radio station. The problem with this approach is that you have no idea what song the channel will play next. Not to forget about Ads. Advertisements aired on the radio channels last for 5 to 10 minutes. The best way to enjoy music is to download apps through which you can stream or download your favorite songs free of cost. If you save the track on your mobile phone, you can hear the downloaded song as many times as you want without turning on the mobile/WiFi data connection. 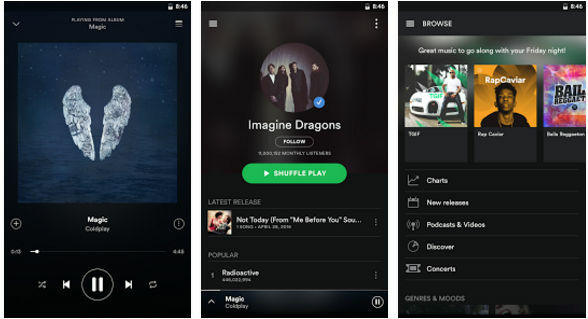 Many companies have launched music streaming apps. Unfortunately, not all applications allow you to download songs on your device. Spotify is the most popular music streaming service in the world. Its Android and iPhone application has over 200 million active users. 80+ million users have given Spotify a nice rating of 4.5 on a scale of 5 on various App Stores. The Spotify app has a material design based UI. It provides several features. The app displays the album art of the track which you’re listening to. It also suggest songs, albums, and artists when you’re in listening mode. The app features 100s of playlists created/shared by other users and music experts. It includes a search option. Spotify users can download MP3 songs on their mobile devices only if they become a premium user. If you opt for premium membership, you’ll enjoy high-definition music without advertisements. 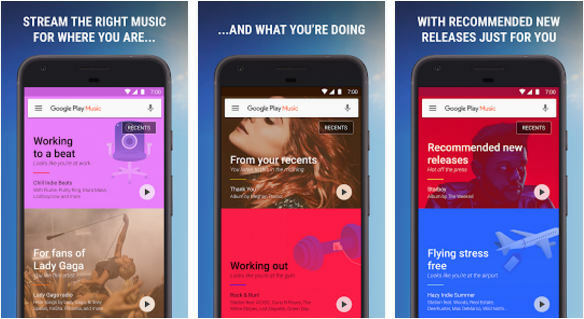 Play Music is a premium music subscription service launched by the search engine giant Google. To use GPM, you must buy one of its subscription plans. Once you’ve bought a plan, you can stream and download unlimited songs on your mobile device. GPM gives you access to millions of English and Regional songs. It doesn’t have advertisements. GPM lets users filter songs by their name, genre, album, singer, etc. It also allows you to search for songs by name. The Google Play Music features a library section where users can upload the songs saved on the storage memory of their mobile device. It features a radio section through which you can listen to songs of your favorite artists continuously. The Play Music app comes pre-installed on all handsets running on the stock Android OS. Amazon Prime music is a good alternative to the above two applications. Try it out if you don’t like Google Play Music or Spotify. 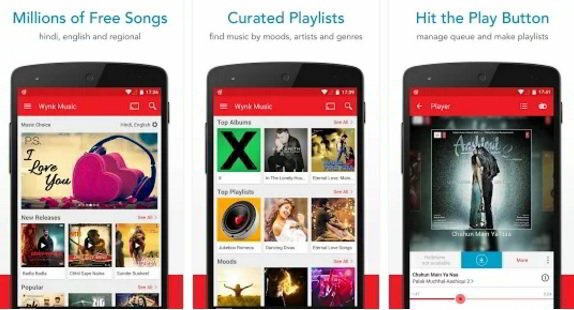 Wynk is a free app from Airtel with you can listen up to 2.5 million songs. The app is advertisement free. It features an inbuilt music player. Hence, you can use Wynk to enjoy MP3 audio tracks saved on your mobile. Wynk is compatible with Google Chromecast. It allows you to stream songs on PC from a mobile device. To use this feature, make sure your internet connection speed is fast. Apart from songs, the free Wynk app features 20+ radio stations. It offers playlists for various moods. The list is compiled by experts. Wynk has a beautiful user interface. It is free to use for 30 days. You can download max 100 songs during the trial period. Premium subscription costs just Rs 99. If you want to download unlimited songs, become a Pro user of Wynk. Saavn is one of the most downloaded Indian apps on the Google Play Store. It has a library of 30+ million songs. You can stream as many songs as you want with the free Saavn app. To download a song, you’ll have to become a Pro user. The subscription fee for the same is Rs 99. The Pro version of this music streaming app does not have ads. It lets you download songs in HD quality (320 kbps). The app gives you access to original content which includes audio programs narrated by popular artists. It provides an option to create playlists and share songs with friends on social networks. Ghazals, bhajans, dance, romance, etc. Gaana is the only app on our list that lets you go through the lyrics of a song. It lets users hear over 9 million songs in various languages. You can also listen to the popular radio stations in your country with the Gaana app. 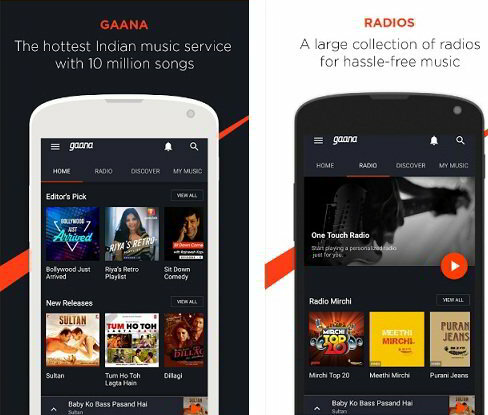 Like other apps we’ve covered here, Gaana provides a premium subscription service. When you buy a subscription plan, you can stream songs in HD quality. You can also download songs. Conclusion: If you love music, install one of the above apps on your tablet or phone. 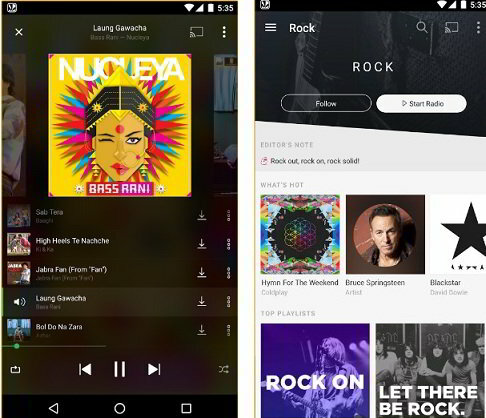 Spotify, Google Play Music, Wynk, and Saavn have cheap subscription plans. They give you access to several million HD quality songs.